Spring Seoul is looking much better than earlier. I am happy to be back from my travels in Beijing. 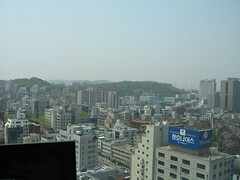 The air is so much cleaner here in Seoul! I’ve just corrected some spelling mistakes and added some links to some appropriate pictures to my blog posts of my 10 days in Beijing, China. I’ve had my post-travel disaster, by washing a 2USD towel I had to buy because it’s cheaper to buy a new towel in China than actually wash it, with the rest of my clothes! AARRGGGHHHH! I’m not sure how to fix this. 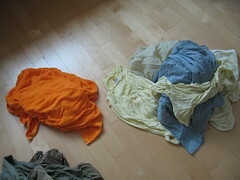 I am just washing the clothes again and taking up prayer. Argh, it hasn’t helped. Since my last post I discovered Beef Noodles! They are so incredibly delicious. I had them in a pleasant artsy area just south of Tienanmen square by bike of course. 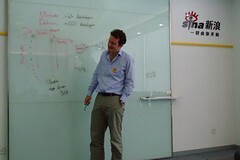 Last Tuesday I visited the Sina offices and gave a impromptu webpy presentation for the Beijing Python User Group. It went well and they asked me also to talk about Debian, as they were unfamiliar with it (to my surprise). Nice bunch of guys. 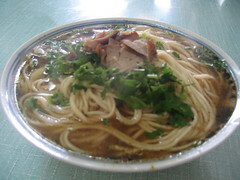 Afterwards we went out for Taiwanese cuisine where you cook fresh food in a hot broth. Very good. They were all impressed I could drink three large bottles of beer in such a short space of time. I’ve been practicing and my throat was so dry from the air pollution in Beijing. I’ve also uploaded some videos of China I took with my sister’s camera. This is my favourite video with me riding along the top of Tiananmen.